1. This is old knowledge, but I needed a reminder. I hit the ball very straight, but I often push it. The fix is to finish the turn so my belt buckle faces the target. 2. Leaving putts short is an insidious habit. The way to cure it is to leave your head down for a few seconds after you have struck the ball. Don’t look, don’t peek. The ball will get to and past the hole. 3. When chipping, take the club back and let it fall back into the ball in a controlled way — a gravity move guided by the hands. This gives you surer contact and more control over the length of the chip, which is determined solely by the length of the backswing. I use three clubs to chip with: 7-iron, 9-iron, and 56-degree wedge. My newest YouTube video is now posted. It is titled, “Unfreezing Your Golf Swing.” It concerns the habit of stepping up to the ball and waiting far too long to take the club back. Learn also about the sequence of using the conscious mind and the subconscious mind when hitting a shot, which applies to everyone. You, however, don’t have to go to YouTube. You can watch it right here. I’ve written a few times in the past about aiming your shot when you take your stance. What I want to talk about in this post is aiming your swing, and that’s different. You’ve likely heard about swing plane and all that. What I’m going to get at here is where that plane is aimed. Your swing traces an arc going back and another one going through the ball. That second arc is relevant to aim, and to hit the ball at your target, that arc must be aimed at the target. In one meaning of the word “swing,” the golf swing is the totality of movement away from the ball and back through, all the way to the finish. Another meaning is that something literally swings. What swings in the golf swing are the arms and golf club. The body doesn’t swing. It turns. From the shoulders on down to the clubhead is the part of your body (consider the club to be an extension of your arms for this argument) that swings. What you want is for the swinging of this unit to be headed toward the target at impact. It will not do to imagine a line on the ground and have the clubhead travel along that line. That quickly turns into steering the clubhead, which interrupts the smooth, connected flow of your swing, in both sense of the word. Now all that has been a complicated description of a rather simple move. But I believe you will find it is true. You will correct a lot of swing problems by aiming your swing in this way. You can learn this movement by making half swings, and gradually moving up to full swings. 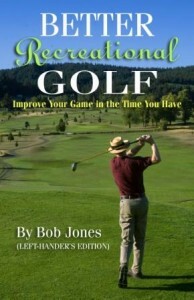 * There is also the part about your hands leading the clubhead. If your hands follow the clubhead into the ball, which they do if you persist in trying to hit the ball rather than swinging through it, none of the above is of any use. There are many reasons for playing golf. If your number one reason is to have fun, try this playing style. Use a limited set of clubs, and play fast. I’ll explain what I mean. The rules of golf allow you to carry fourteen clubs. You don’t need that many, though. You can get by just fine with only seven. In fact, Francis Ouimet won the 1913 U.S. Open with that many clubs in his bag. With a smaller set of clubs, two things happen. You stop getting stressed over getting just the right club in your hands, because except for on the tee and on the green, you hardly ever do. Instead, you take out the club that is close enough and create your own shot. Without too much practice, you will surprise yourself at how good your instincts are, and have a lot more fun because you figured it out on your own. 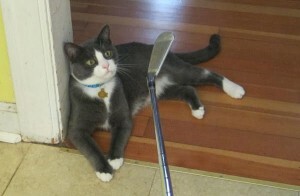 You’re that much more of a golfer. My set of seven is: driver, 19-degree hybrid, 24-degree hybrid, 7-iron, 9-iron, 56-degree wedge, and putter. With those clubs, I can manufacture almost any shot I need. I shot an 81 one day on a course I had never seen before using this seven-club set. It was easy, and it was fun. Here’s another benefit. Seven clubs don’t weigh very much. This is a really light bag to carry. Carrying is more fun than carting, believe me. Now what do I mean by play fast? I don’t mean that you race around the course. I mean you play efficiently, and without delay. On the tee, your driver is ready, you tee up the ball, aim yourself, address the ball, and hit it, just about that fast. If you’re the last player to hit, you pick up your bag and clubhead cover and start down the fairway. You can put the cover on your driver and put the club in the bag as you walk. From the fairway, you do the same thing. Quickly assess the situation, distance, lie, wind, choose your shot, take your club out of the bag, address the ball, take one look, and swing, again, just about that fast. On the green, you read the putt, quickly, relying on your first impression, since it’s almost always correct, step up to the ball, take a look, and putt. That fast. All this sounds like you’re in a big rush. You’re not. You’re just not taking time doing things that have nothing to with hitting your shot. It takes you about five seconds to figure out your shot. Why take 15 or 20? Once you address the ball, why stand there? Get into your stance and hit! You will find, too, that hitting quickly doesn’t give you enough time to start getting worried about the things you worry about. You do your thinking, hit your shot and it’s over before you had a chance to get nervous. Have you ever played an entire round without getting nervous or caught up in the shots you hit, and instead, just hit them? 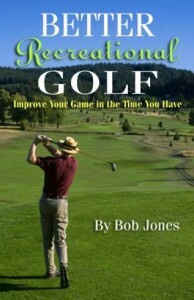 If you want golf to be relaxing, this is how to do it. What about your score? It will take a few rounds to get used to playing with fewer clubs, creating shots and playing with distances. When you do, you will probably wonder why you carried so many clubs before. 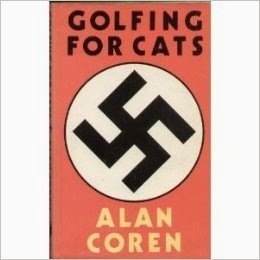 As for playing fast, I guarantee you will improve, especially on the green. This style makes you play more intuitively. That means not second-guessing yourself all the time and going with what you know is the right thing to do. 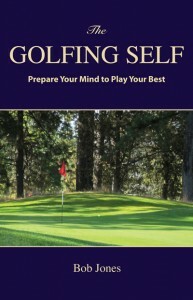 That calms your mind, which leads to your body hitting your best shots more often, which means lower scores. Play light, play fast. Give it a try yourself. You might never go back. When you bend over to address the ball, you must not lower your hips at the same time. Keep them where they are to create a level swing and maintain your balance. Try this. Stand upright and put a 5-iron on the ground right against your leg. It doesn’t matter which one. Notice where the top of the grip hits your hip. Now lower yourself into your stance like you usually do. If that spot on your hip is now lower than the top of the grip, you’ve made the mistake I’m warning you against. Try again, this time taking your stance while keeping your hip where it is. It might help to think that you raise your hip up and back as you bend over. Actually, it will stay in the same place. Don’t forget to bend your knees if you have to. Do this over and over until you get used to it, then take that 5-iron into your hands and swing it. I believe you will find your swing to be a lot smoother than it was before, and you will finish with very good balance. This is one of those little things that you don’t read about in the instruction books. All the good golfers do it, though, just watch on TV. You can do it, too.